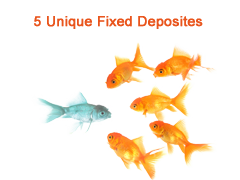 Fix deposit are among most popular investment options, If you are planning to invest in fix deposit and looking or something unique you are at right place, we are herewith unique fix deposit schemes for Investment in India. IDBI Freedom Fix deposit is unique Fix deposit which offers higher rates of Interest with assure liquidity. IDBI Freedom Fix deposit gives flexibility in terms of premature withdrawal without penalty. For example, for investment in the maturity bucket of “1 year 1 day up to 5 years”, the customer can withdraw his/her deposit any time after 1 year 1 day and yet get the benefit of a 9% interest rate. Thus, the customer gets assured liquidity and higher return, with “freedom”, from a longer lock-in period. Freedom from long lock-in period. Best Suitable for: – Investor looking for higher return with freedom from lock-in period. ICICI Dream deposit is unique offering that enable investor to realize their dream at every stage of life. Best part of this dream deposit is it is associated with predefined goal; Goal could be child’s education, daughter’s marriage, owning a home, driving our car or planning our retirement. Deposit attached to specific goal. Flexibility in terms of choice based on needs. Best Suitable for:- Investor looking for goal base investment in debt instrument. More detail about ICICI Dream deposit can be obtained from ICICI Website. ICICI iWish is another unique offering from ICICI Bank. iWish is goal specific flexible recurring deposit which gives flexibility to investor, here you can choose to deposit money at your convenience and you have option not to deposit any money in a month. There are no penalties or charges if you fail to deposit money in any month. You can even deposit money multiple times in this deposit. Flexibility in terms of depositing money any time any amount. One can deposit money multiple time in month. There are no charges if funds are not deposited in a month. Your friend or family can contribute to your goals. Best Suitable for:- Investor who has irregular income and want to invest money based on convenience. If you have spare cash for few days and want to invest SBI Unfixed fix deposit is unique scheme. You can park money in this scheme for short time and earn good return. Unfixed deposits are available for short-term ranging from 7 days to less than 1 year. Money can be withdrawn any time after 7 days, without charges. If the money deposited under unfixed deposit is withdrawn before maturity then interest will be paid on the basis on number of days an investor remains invested. Interest rates are at par with fix deposit schemes. Best Suitable For:- Investor who has spare cash for few days and want to earn good return with capital protection. Another unique fixed deposit which can double your money in SBH double ka meetha fixed deposit by State Bank of Hyderabad. This fixed deposit would get doubled in 91 months for general public and 87 months for senior citizens. Best suitable for: Investor who want to double money with a specific term deposit scheme. If you want to explore other unique fix deposits you can go through this list. Select any good scheme according to your goal & investment planning creation. Feel free to share your views in comment section. i have to double money in 5 year. You can invest in equity or mutual fund.Equity or Mutual fund investment can double your money very fast.